THE INDEPENDENT FEB 2015 - Scientists estimate that about 8 million tons of plastic debris such as food packaging and plastic bottles are being washed into the oceans each year – and the cumulative quantity of waste will result in a tenfold increase in the total amount of plastic in the sea by 2020.Orca (Orcinus orca) hunting a Weddell seal in the Southern Ocean. Drifts of floating plastic that humans have dumped into the world's oceans are flowing into the pristine waters of the Arctic as a result of a powerful system of currents that deposits waste in the icy seas east of Greenland and north of Scandinavia. In 2013, as part of a seven-month circumnavigation of the Arctic Ocean, scientists aboard the research vessel Tara documented a profusion of tiny pieces of plastic in the Greenland and Barents seas, where the final limb of the Gulf Stream system delivers Atlantic waters northward. The researchers dub this region the "dead end for floating plastics" after their long surf of the world's oceans. The researchers say this is just the beginning of the plastic migration to Arctic waters. "It's only been about 60 years since we started using plastic industrially, and the usage and the production has been increasing ever since," said Carlos Duarte, one of the study's co-authors and director of the Red Sea Research Center at the King Abdullah University of Science and Technology in Saudi Arabia. "So, most of the plastic that we have disposed in the ocean is still now in transit to the Arctic." The results were published Wednesday in the journal Science Advances. The study was led by Andres Cozar of the University of Cadiz in Spain along with 11 other researchers from universities in eight nations: Denmark, France, Japan, the Netherlands, Saudi Arabia, Spain, the United Kingdom and the United States. "The plastic pieces that may have been initially inches or feet in size, they have been brittled by exposure to the sun and then fragmented into increasingly smaller particles, and eventually led to this millimeter-size plastic that we call microplastic," Duarte said. "That process takes years to decades. So the type of material that we're seeing there has indications that it has entered the ocean decades ago." Finally, the study didn't find much plastic in the rest of the Arctic ocean beyond the Greenland and Barents seas, also suggesting that currents were to blame. Instead the plastic had accumulated where the northward-flowing Atlantic waters plunge into the Arctic depths. Presumably, the plastic then lingers at the surface. The Greenland and Barents seas contained 95 percent of the Arctic's plastic, the research found (the ship sampled 42 sites across the Arctic Ocean). The Barents Sea happens to be a major fishery for cod, haddock, herring and other species. A key question will be how the plastic is affecting these animals. The study's results sent a troubling message to one researcher who has also focused on the consequences of plastic debris in the oceans and other waterways. "Isn't it kind of ironic that days before Earth Day there is more demonstrated proof of widespread contamination of our plastic waste in places that are so far from the human footprint and thus locations we consider to be pristine," said Chelsea Rochman, a marine ecologist at the University of Toronto who was not involved in the study but praised it as "a great contribution to the field." The ocean circulation system in the Atlantic responsible for this plastic transport is part of a far larger "thermohaline" ocean system driven by the temperature and salt content of oceans. It is also often called an "overturning" circulation because cold, salty waters sink in the North Atlantic and travel back southward at deep ocean depths. As humans now put 8 million tons of plastic in the ocean annually, learning how such currents affect the plastic's global distribution is a key scientific focus. Researchers, including Duarte, previously found that plastic slowly travels the world's oceans but tends to linger in five "gyres," or circular ocean currents in the subtropical oceans in both the northern and southern hemispheres. One of those gyres is located in the Atlantic, which then feeds the Arctic. Scientists noted that the vast majority of ocean plastic becomes lost before it reaches the Arctic. They aren't sure where most of the plastic falls out and are researching to determine those locations. "The plastic that escapes those traps is the one that actually makes it into the Arctic," Duarte said. "But when it enters the Arctic, there is no way out, it just stays there and is stuck there." Rochman said she feared that as the Arctic becomes more accessible because of ice melt linked to climate change, more plastic could wash in. "As the ice melts, we may see increasing concentrations of plastic in the Arctic due to the opening of passageways for vessels and plastics in surface currents," she said, "as well as plastics in the ice becoming free to float and interact with marine animals upon melting." 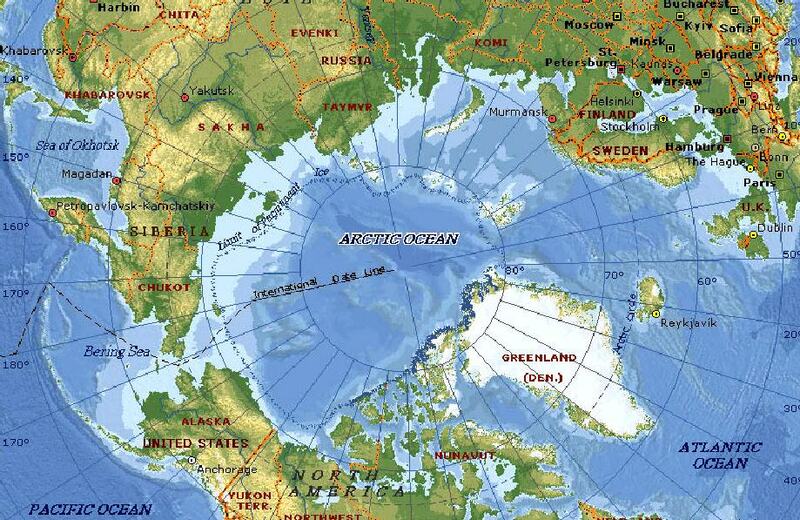 TOPOGRAPHY - The Arctic Ocean is the smallest and shallowest of the world's five major oceans. 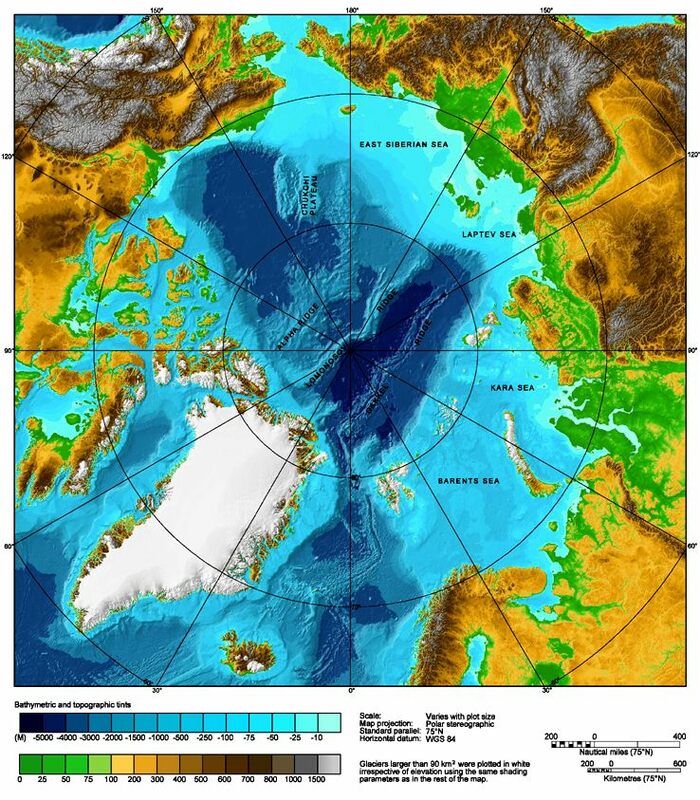 The International Hydrographic Organization (IHO) recognizes it as an ocean, although some oceanographers call it the Arctic Mediterranean Sea or simply the Arctic Sea, classifying it a mediterranean sea or an estuary of the Atlantic Ocean. 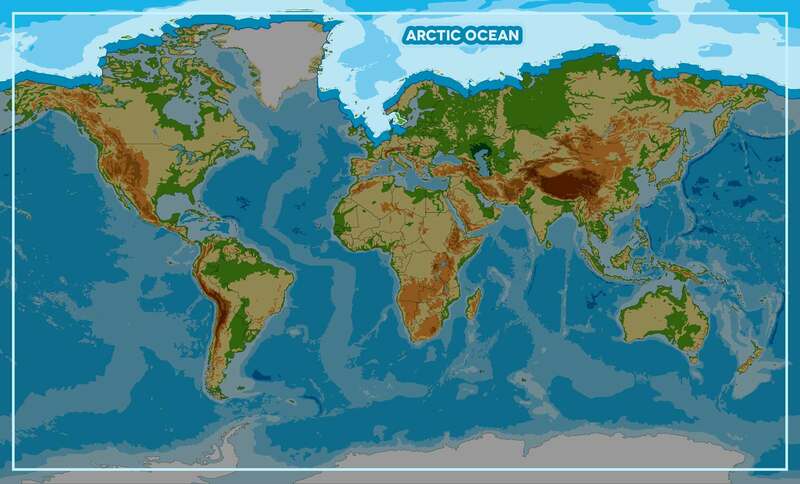 Alternatively, the Arctic Ocean can be seen as the northernmost part of the all-encompassing World Ocean. 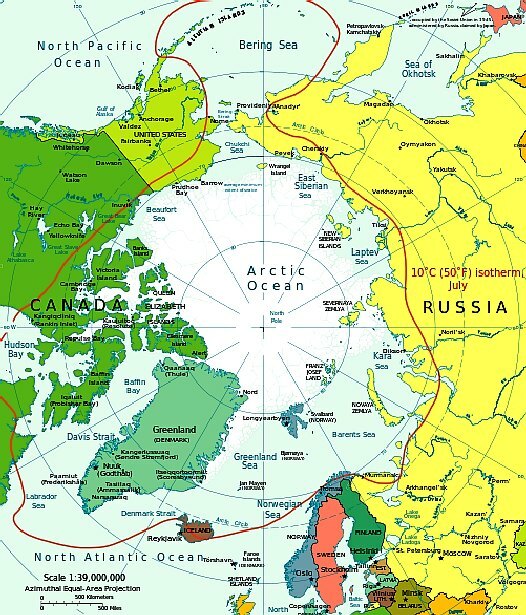 AREA - The Arctic Ocean occupies a roughly circular basin and covers an area of about 14,056,000 km2 (5,427,000 sq mi), almost the size of Antarctica. The coastline is 45,390 km (28,200 mi) long. It is surrounded by the land masses of Eurasia, North America, Greenland, and by several islands. Calgary, Alberta: Arctic sea ice may be thinning faster than predicted because salty snow on the surface of the ice skews the accuracy of satellite measurements, a new study from the University of Calgary said on Tuesday. The report from the Canadian university's Cryosphere Climate Research Group published in the academic journal Geophysical Research Letters found satellite estimates for the thickness of seasonal sea ice have been overestimated by up to 25 percent. "The problem is, microwave measurements from satellites don't penetrate the salty snow very well, so the satellite is not measuring the proper sea ice freeboard and the satellite readings overestimate the thickness of the ice," Nandan said. The sea ice freeboard refers to ice that can be seen above sea level and co-researcher John Yackel said, "Our results suggest that snow salinity should be considered in all future estimates on the Arctic seasonal ice freeboard made from satellites." OCEAN AWARENESS CAMPAIGN - As part of the Cleaner Ocean Foundation's ocean literacy campaign, we are developing a game that can be played on mobile devices like the iphone or android smart phones. In this game children learn a little about geography as they select one of five ocean areas to rid of marine litter. The screen above shows that the player has selected the Arctic Ocean to tackle. Copyright Map © January 29 2018 all rights reserved COF Ltd. Copyright Maps © January 29 2018 all rights reserved COF Ltd.
NORTH POLE - These inqusitive polar bears inspect the surfaced submarine USS Honolulu.